This picture of an Afar girl was taken in the market in Senbete, Ethiopia. Afar (sometimes called Danakil) women and girls sell milk, animal hides, and salt (from desert mines) at marketplaces in Senbete and Bati. 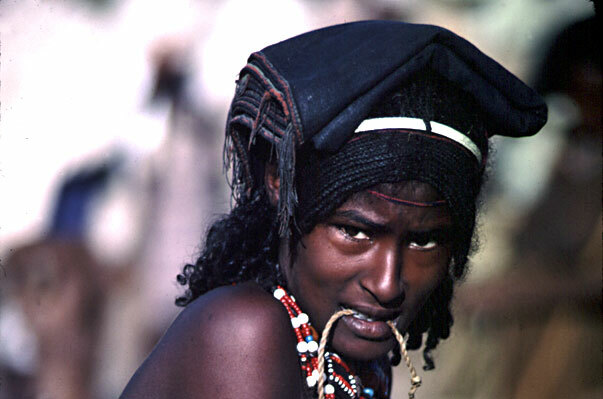 Being nomadic pastoralists, Afar girls traditionally subsist on a diet of milk and meat from wild game, unlike the diet of those living in the cities whose nutritional regime consists of primarily rice. Afar girls are responsible for many of the more labor intensive tasks such as loading and unloading camels (as shown in the above photograph of the Afar girl with twine in her mouth) and setting up camp in the desert. Afar girls traditionally live in tents in the desert, and they call their tent house an "ari" in their language. Being nomads, the Afar girls can setup camp in a manner of minutes. Other laborious chores normally assigned to Afar girls include tending and herding animals such as camels, cattle, goats, and sheep. As is their tradition in Afar culture, they still practice circumcision on both Afar girls and boys. Boys are expected to be brave and endure the pain without emotion, and then are permitted to choose an Afar girl to marry as interethnic marriages are not encouraged.